UPDATE: Enjoy this project in the dining room of our former home. We’ve moved and are giving our new-to-us home a complete remodel. I’ve completely changed my style! Click HERE to take a look. The base of the whole vignette is a hemmed square of dropcloth fabric, that I taped off to create the red stripe around the perimeter and then used a star stencil to add all of the stars. I just used plain old craft paint to do all of the painting. 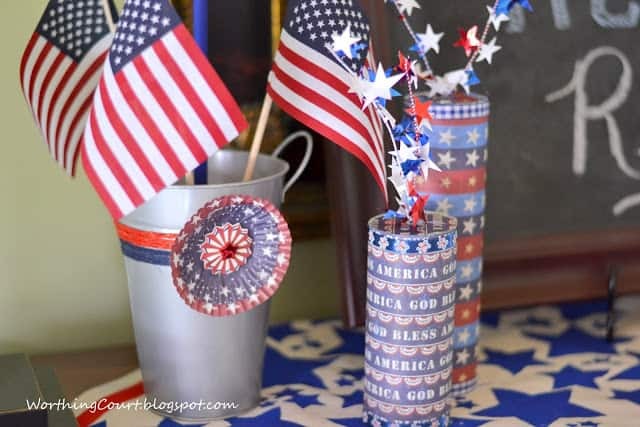 The buckets holding the dowels for the mini-bunting are Dollar Tree finds that I spray painted a brushed nickel finish, wrapped with red and blue twine and added little flowers that I created by layering a couple of cupcake wrappers. A little star shaped gem glued to the middle adds more dimension. 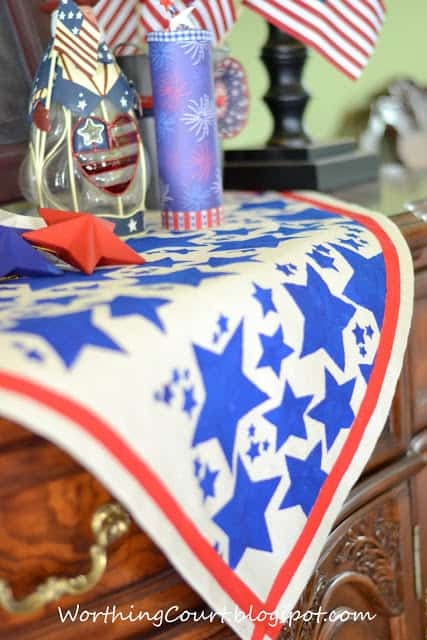 The bunting itself is made with red twine and double-sided flag shapes that I cut out of scrapbook paper. Sooo easy. 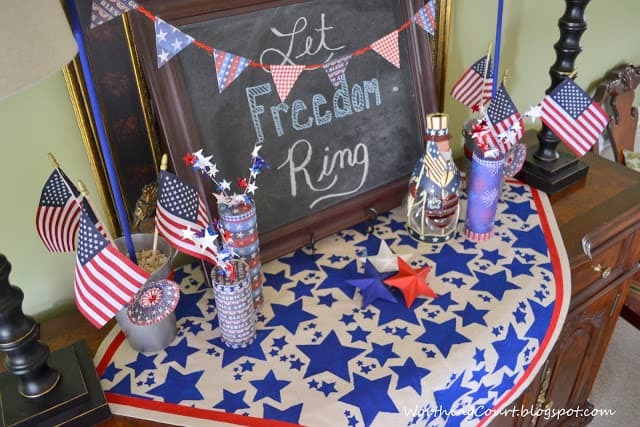 I pulled out the “firecrackers” that I made for my July 4th table last year and added them to the vignette on either side of the chalkboard. Old faithful Uncle Sam has been hanging out around our house for several years. I sure do wish that I could be a chalkboard artist extraordinaire like so many of you, but alas, I am not. This is about the best that I can do. I’ve since learned an easy peasy way to get perfect chalkboard art every time. Such a great job! 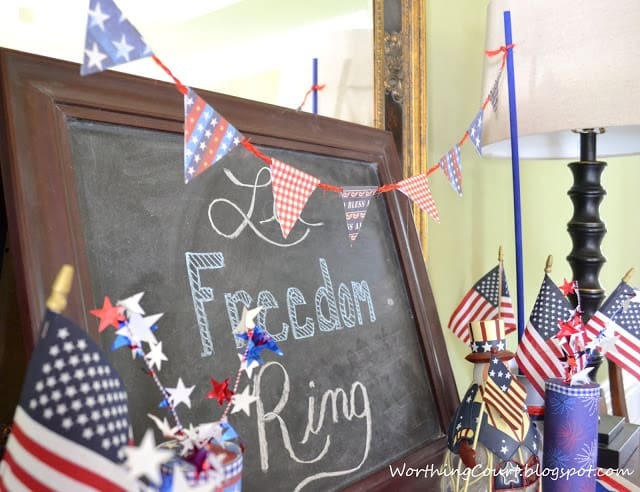 I love all things July 4th inspired! I feel like I need to stand up and salute! So patriotic and festive!!! Your little bunting is ADORABLE!!! 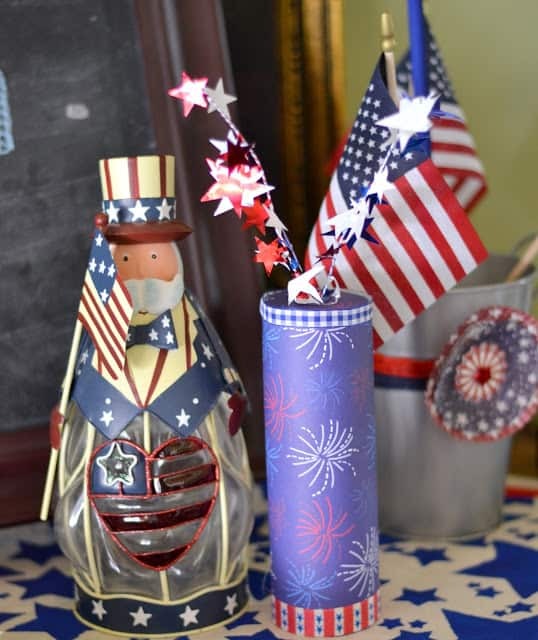 YOu are certainly ready for the 4th! A star spangled post! Hi, this is so neat. Uncle Sam is so cute. He is shaped just like me, well, he is my Uncle Sam! You did a fantastic job on the table scarf. I really love the cupcake liner flowers. Kudos to you! Cute vignette! I love the vintage patriotic look, too…and yes, God Bless America. This looks adorable, I want to do a vignette but don’t know if I have enough stuff! I love your chalkboard and your Uncle Sam! 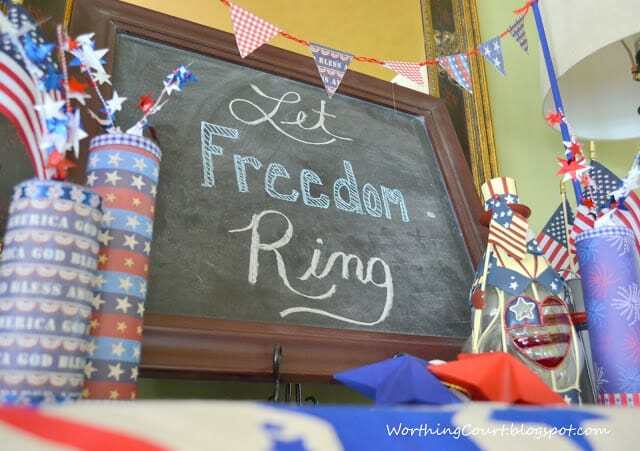 Love the chalkboard, yes indeed, Let Freedom Ring. Love your sideboard display. 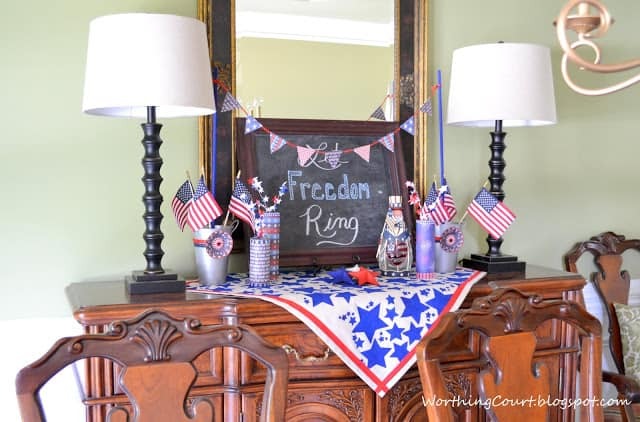 Love your patriotic vignette! Would love for you to share at Simple & Sweet Fridays. New Follower! 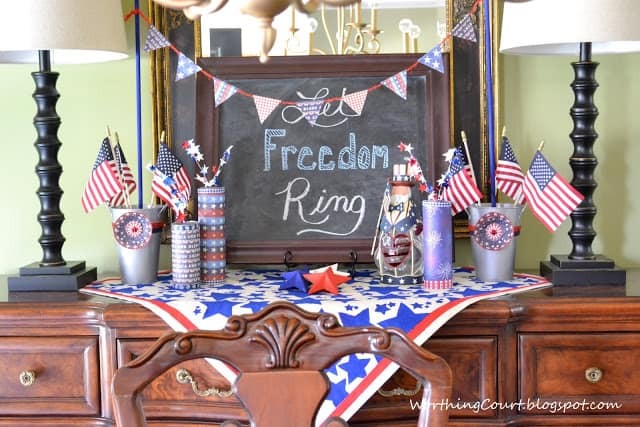 I love your little patriotic vignette, it makes a much bigger statement to have it all together instead of trying to spread it out across one room. 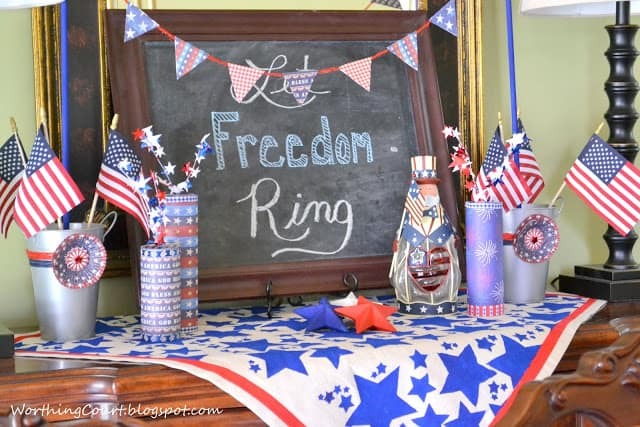 I am not decorating for the 4th this year because I am in the midst of a whole house redo and my house is in such a disarray at the moment! Thanks so much for commenting on my fence board wall! I looked at your house tour, you have a beautiful home! Would you mind telling me how you make your photo collages (where there are 3 or 4 pictures of the same room in one)? I would like to be able to do that on my blog!